Country Club Vacation has always been on the top for serving its members the entertainment and leisure services. It’s always been creative in organizing stress-busting & engaging activities for its esteemed members. This Saturday, 30th May, Country Club India brings to its members the ‘DJ NIGHT’. Groove and jive to the best mixes ever made by the top DISC JOCKEY of the city with your loved ones and rejuvenate your senses! Flaunt your moves and be the star of the night and enjoy till eternity! 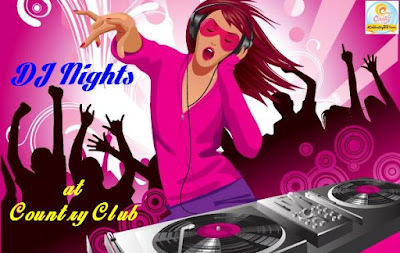 DJ NIGHTs at Country Club are more fun with a variety of cuisines and drinks and mocktails available to the members along with the best music tracks. We assure you will experience the best and the most memorable DJ NIGHT with Country Club’s Kool Undri, Pune. So this Saturday i.e. on May 30, 2015; be there at Country Club’s Kool Undri, Pune, with your besties or your family and have fun and frolic never like before, 08:00PM onwards. Members entry is free. For more details, please contact: 8600410009 / 8600420009 / 020 – 65116580.